I found the Patagonia R1 Flash Pullover on sale for about $79 around last August. I thought it was a good deal as there was a lot of hype about the R1’s at that time in some forums. 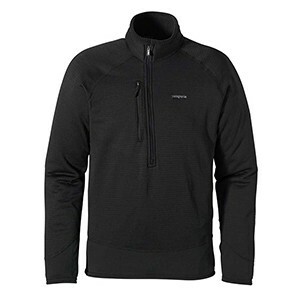 Now Patagonia does not offer the Flash Pullover any longer, but still offers the regular pullover, as well as the hoody. The difference in the flash pullover and the regular pullover is that the flash pullover uses the stretch Capilene 4 material under the arms for increased ability to stretch and breathe, as well as around the bottom of the pullover. This allows for the pullover to hug the waist area, and not allow drafts to come up the shirt. It also serves as a long skirt around the bottom of the pullover so that it is easy to tuck in if desired to do so. The Capilene 4 is also at the end of each sleeve so that drafts cannot slip up the sleeve cuffs. The flash pullover also features a zipper that is slightly off-set so that the zipper does not sit under the chin and rub the skin raw. The pullover has 1 large spacious zippered pocket on the right side of the chest. The actual shirt is made from the recycled polyester, and the inside is grid design. These small waffles allows for exceptional breathability, as well as good compressibility. Also, the small grid design captures moisture from the skin and moves it to the outside of the pullover so that it is able to evaporate. The pullover is listed as a slim-fit, but it is still roomy enough to easily layer a base layer underneath it. I have come to love this shirt. Regardless of the thickness, the grid design does in fact allow for maximum airflow through the shirt, because I have worn this shirt comfortably in temperatures near 60* F. This is on days that temperatures fluctuate a lot though. The morning would start out around 30* f and then raise during the day, so it would be a cool near 60* temperature. The deep zipper helps to vent this shirt very well, which allows the shirt to be used in a wide range of temperatures. I have also worn this shirt layered over my Patagonia Capilene 2 long sleeve crew shirt, and this has very quickly become my go hiking outfit for cold weather. This is a very nice set-up. The pullover is also proved durable. I have worn this pullover as my outer layer most of the time and it has held up well from both tree limbs that has snagged at it, as well as the weight from my shoulder straps and my hip belt on my pack with weights up to 55 pounds. This shirt was well worth the money that I spent on it. I have put it under the mid layer section because it is not quite heavy enough to be a true insulation layer. However, this piece can certainly be used as an insulation layer in the right temperatures. This again is all the reason that this pullover is a great and versatile piece. if the time ever comes to retire it I will be looking for another R1 to replace it. 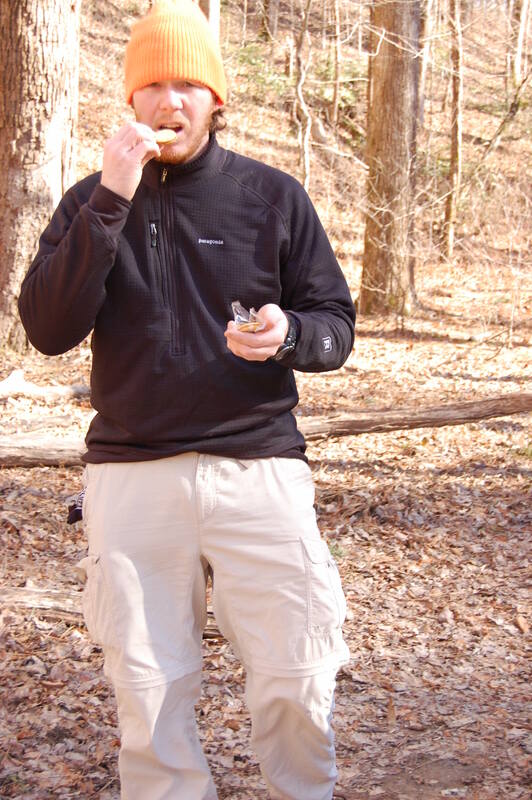 Here is a picture of me wearing it this past New Years Day on the trail at Sipsey Wilderness in Alabama. Temperatures here was in the high 20’s. (Our water bottles were freezing in our packs as we were hiking.) I am wearing the Capilene 2 long sleeve crew under the R1, and I was toasty warm.